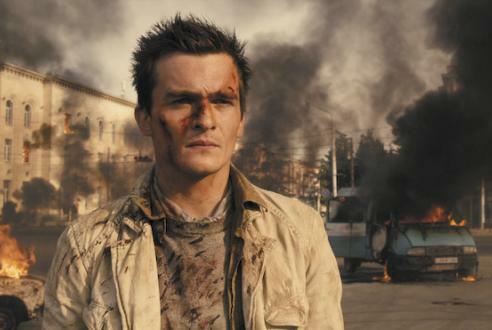 Rupert Friend lives to see another day--for now--in 5 Days of War. Based on true events, the action-filled movie 5 Days of War tells the story of a group of people caught behind enemy lines during 2008’s devastating five-day war between Russia and the Georgia Republic. Directed by Renny Harlin (The Long Kiss Goodnight), the film centers around an American journalist (Rupert Friend, The Young Victoria) and his cameraman (Richard Coyle, Prince of Persia: The Sands of Time) as they are caught in the combat zone during the first Russian air strikes against Georgia. Rescuing Georgian schoolteacher Tatia (Emmanuelle Chriqui, Women in Trouble) from the attack, the two reporters agree to help reunite her with her family in exchange for serving as their interpreter. As the three attempt to escape to safety, they witness — and document — the devastation from the full-scale crossfire and cold-blooded murder of innocent civilians. The R-rated movie also stars Andy Garcia (City Island), Heather Graham (Father of Invention) and Val Kilmer (MacGruber). 5 Days of War received a limited release to U.S. theaters in August 2011. Reviews weren’t all that impressive, though the majority of them noted that the film delivers some extreme and brutally violent battle sequences. Bonus features include a commentary track by Harlin and a collection of deleted scenes.